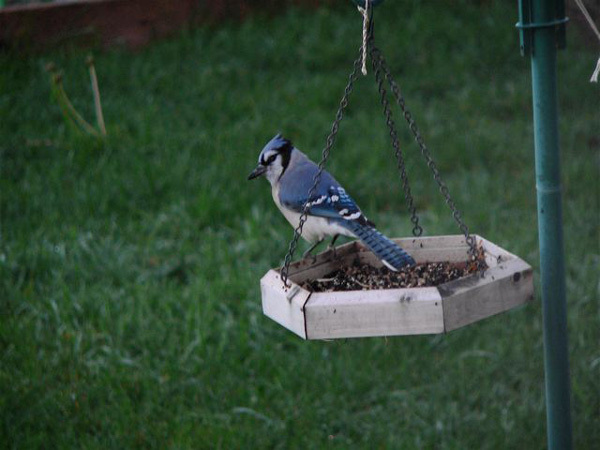 Message from Brian Mickelson: For the last week, well, at last 4 of the last 7 days, a BLUE JAY has visited our feeder, spent time in the tree in our backyard and made quick a bunch of noise. Always at about 7:00 am until about 7:30 am. Then he's off. How common, or uncommon, is this bird around here? I've been through Sibley's guide and it seems like I wouldn't see one very often, or at all, except maybe during the winter (?). Link to the "Comprehensive List of Rare Bird Sightings"
(click on "Jays" and then on the archive link).